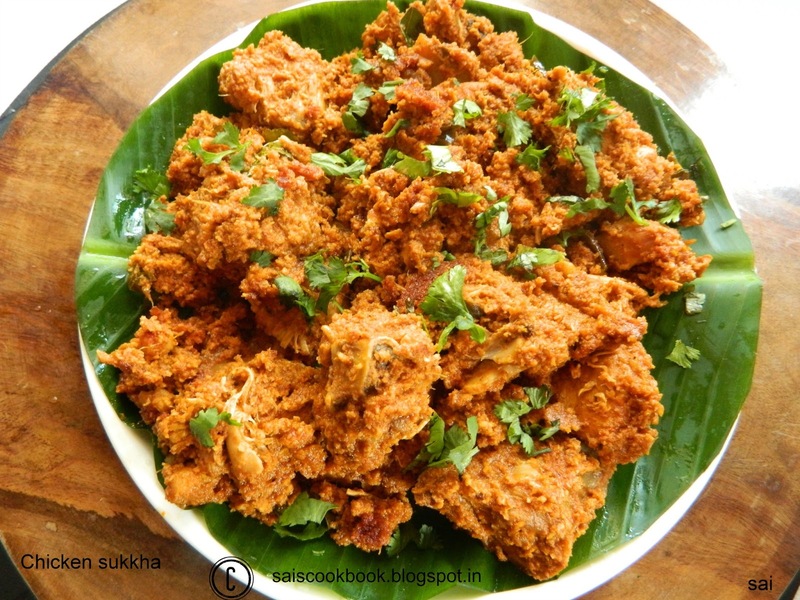 Chicken Sukkha is a popular Mangalorean Bunt cuisine. My blog would have been incomplete if I would not have shared this recipe. Few days back my FB friend Nandini Kini had posted this yummy recipe in a food group and it looked so inviting I wanted to try it right away. 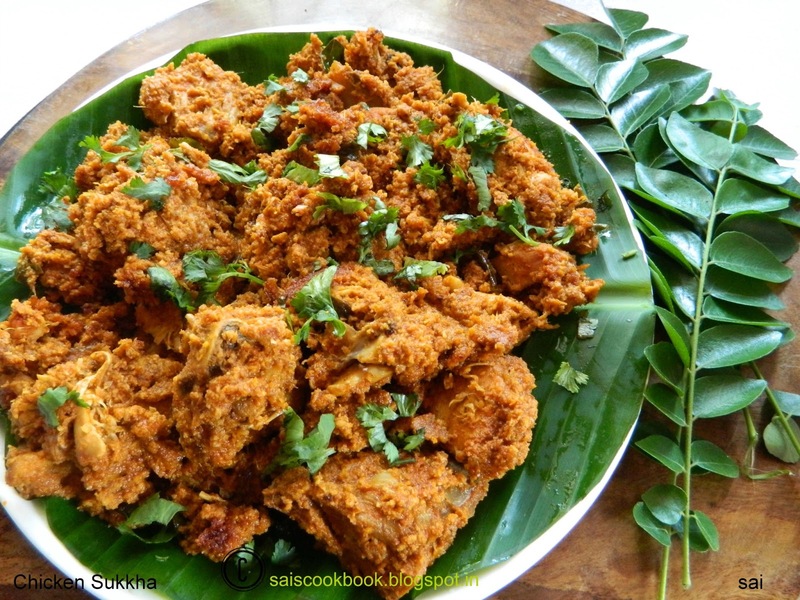 Chicken sukkha is served in most of the Bunt community weddings or receptions. 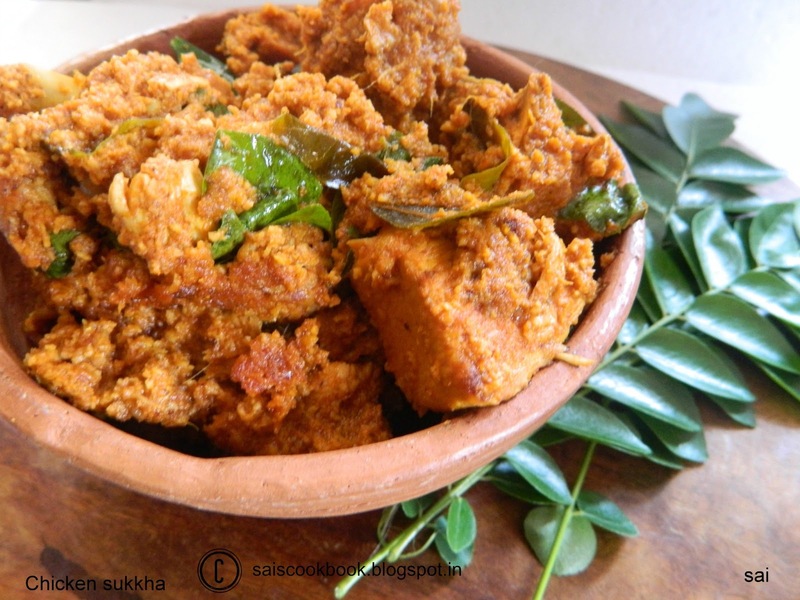 Usually they prepare it authentically with the Nati koli or the country chicken.This dish is best served with pundi and neer dosa .There are many recipes of this dish with different variations. I also prepare an instant version which I will post in the coming days. You may also prepare soya sukkha,egg sukkha,prawn sukkha with the same recipe. Heat oil in a pan and roast all the ingredients mentioned under the first masala until brown in colour. (add the turmeric powder once you off the flame to avoid burning). Grind the roasted ingredients,tamarind to a fine paste with little water to a fine paste and keep it aside. 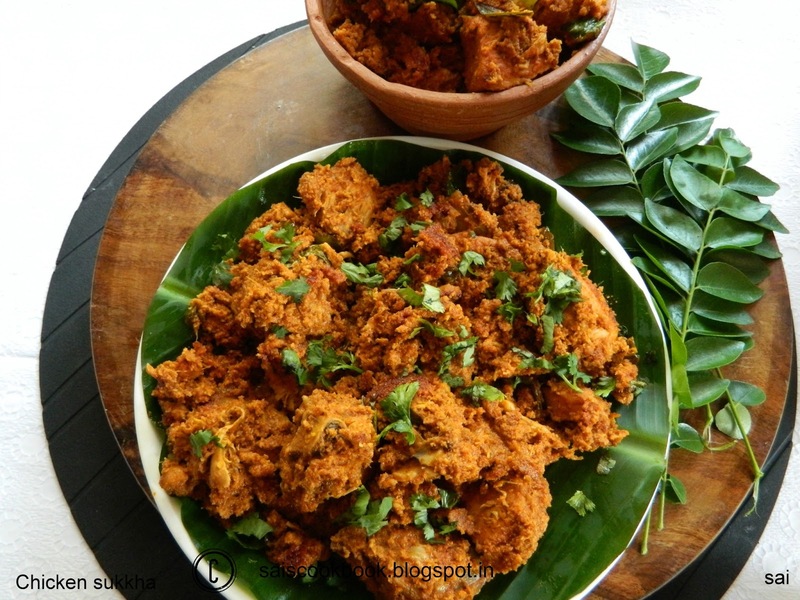 Grind the ingredients mentioned under the second masala coarsely and keep it aside. Heat ghee in a cooking pan and fry onions until translucent,add curry leaves and fry for a minute. Add chicken pieces,add masala water,cover the pan and once half cooked add masala no 1,salt and cook it until done. Once the chicken gets cooked and the masala’s are infused add the second masala and cook it for sometime,add lime juice and cook for 5 more minutes. Masala water is once you grind both the masala,after transferring it to the bowl,add a cup of water in the blender,using your hand or a spoon,scrape off any leftover masala in the water and use it. Generally in most of the dish we use the masala water for extra taste and the masala is not wasted too. Thanks Saigeetha for your recipe. I will try this and get back to you. Wow Sai this Chicken looks amazing. Must try it for sure. Well love this Suka.this is from ayees recipe.. Thanks Anonymus.This recipe is not from Ayees recipe.This is my friend Nandini Kini’s recipe.